We supply many different types of IGUs, including fire rated IGUs for the composite door market. We are certified to manufacture fire glass units to Attestation Level 1, so you can rest assure that our products are manufactured to the highest safety standards every time. 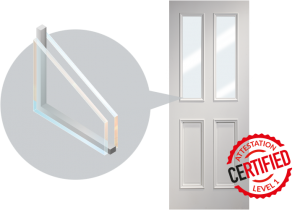 WHAT ARE DOUBLE GLAZED UNITS? Double Glazed Units are also known as IGUs (Insulated Glass Units) – an individually sealed unit made up of multiple panes of glass. Each pane of glass is separated within the sealed unit and has an air vacuum or gas-filled gap between them. Units are usually made up of two panes (double glazed) or three panes (triple glazed). These units are energy efficient and insulate against both heat and noise. The sealed air vacuum or gas-filled gap between each pane creates an insulating barrier that keeps heat in. The airtight seal reduces the flow of incoming and outgoing heat and each pane of glass added to the unit will increase the level of insulation provided. Double Glazed Units / IGUs help reduce energy bills (and carbon footprints) and can be used on their own or with other specialist Energy Efficient Glass to comply with Building Regulations requirements around conservation of fuel and energy. The Regulations set out the minimum U-Value which must be used when installing windows, doors and roof glazing; depending on the type of build / project. Many windows now use the British Fenestration Rating Council (BFRC) standard energy-rating scale (from A to G) to demonstrate the energy efficiency of the product. However, this is where the whole window (including the frame) is assessed. Double Glazed Units / IGUs have a U-Value by way of energy rating; the lower the U-Value the less heat passes through the unit and the better the unit is as an insulator. Typical usage is wide and varied, we supply fire rated IGUs for the composite door market and IGUs made up of other specialist glass such as Safety Glass or Acoustic Glass.